Genevieve Brazelton's deliciously complex, handmade ingredients will make anyone a cocktail star. While managing a bar in San Francisco, part of Genevieve Brazelton's job was coming up with a 10-drink seasonal cocktail menu every few months. (We'd do that for free...hint, hint.) Soon, she was hooked, but not on hooch. Homemade tinctures, infusions, and syrups became her obsession, and later, her business. Add her potions to your poison of choice, and get the same mouthwatering results as if you'd patiently infused exotic ingredients for months. Bright, herbal, and pine-y, Citrus Rosemary syrup brings summery zing to cocktails, Prosecco, or plain seltzer. Flowery, warm, menthol-kissed cardamom bitters—a key ingredient in a number of pre-Prohibition cocktails—add depth to sweeter, fruitier drinks, and also blends right in with the smoky characteristics of an anejo tequila or scotch. Together, the pair sings particularly well with gin (they make a dynamite Tom Collins), but also play nicely with vodka, tequila, or rum. Handmade in Portland, Oregon. Genevieve Brazelton was bitten by the cocktail bug while managing a bar in San Francisco. 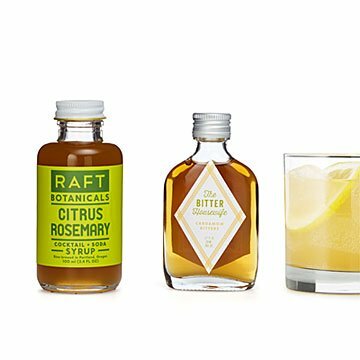 Coming up with a 10-drink seasonal cocktail menu every few months led to enthusiastic experimentation with ingredients and flavor infusion techniques. She began making her own bitters in a quest for the perfect Old Fashioned, and now she runs her own premium cocktail ingredient company in Portland, Oregon. She begins each flavor of bitters or syrup by thinking about which drinks it might be used in, and insists upon all-natural, thoughtfully sourced ingredients for each one. Bitters are shelf stable. Syrup must be refrigerated after opening. Cardamom Bitters: alcohol, water, organic sugar, grains of paradise, cinnamon, cardamom, walnut leaf, quassia and gentian. Citrus Rosemary Syrup: organic cane sugar, organic orange juice, organic lime juice and rosemary. Produced in a facility that also processes peanuts and tree nuts.